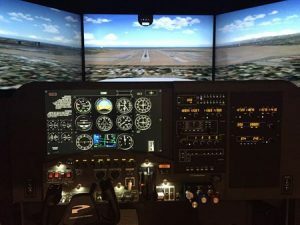 The Advanced Aviation Training Device can simulate a number of different aircraft in a variety of meteorological conditions as well as any time of the day or night. Private Pilot students are able to learn the basics in an unthreatening environment and experience landings on any runway in the world. Instrument students can log up to half of their training in the AATD. A very versatile tool to complement instruction at any level. The Cessna 152 is a two-seat, high wing, 110 horsepower airplane. It is equipped with dual communication and navigation radios (dual glideslope), and Distance Measuring Equipment (DME). 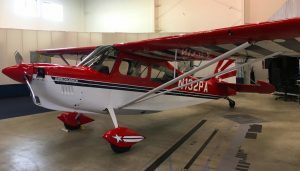 At $110 per hour this airplane is the favorite of those looking for a low cost training option that gives students a significant savings throughout their training. Some people however, feel the cockpit may be too small for them and desire a more powerful engine for better climb and cruise speeds. 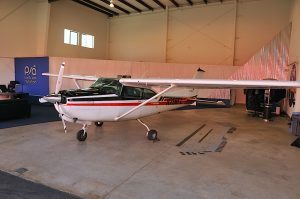 The Cessna 172SP is a four-seat, high wing, 180 horsepower airplane. It is equipped with dual communication and navigation radios, GPS moving map displays, and an autopilot. This airplane has been the “gold standard” training platform for decades and stands on its safety and simplicity. With enough room for any sized pilot and comfortable rear seats it is not just used for flight training but a great versatile airplane to own and use for almost any travel need. Most people love the high wings that give them the beautiful unobstructed views below, and others love them for how forgiving they are in training. At $160 per hour they are still one of the most economic airplanes to fly for what you get. 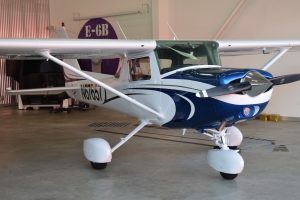 The Cessna TR 182 is a four-seat, high wing, 235 horsepower aircraft with retractable landing gear and a constant speed propeller. This is our more advanced aircraft, perfect for longer distance flying and its ability to heavier loads at 3100 lbs take off weight. The TR182, with the retractable landing gear and constant speed propeller meets the aircraft requirements for Airplane Single Engine Land Commercial Certificate and Certified Flight Instructor Training. The complex and high performance endorsements (additional 10 – 15 hours of training) can also be gained by private pilot students. The Super Decathlon is a two-seat (pilot in the front with the instructor in the back), high wing, 180 horsepower tail-wheel airplane. It is basically equipped; one radio and a GPS. This airplane is all about learning “stick-and-rudder” skills. Although we do not use this airplane throughout your entire flight training, many people benefit from the experience of flying an incredibly sensitive, center control stick airplane to hone their skills. Mainly designed for basic aerobatics it’s also a great platform for learning stalls, spins, and flight emergencies. Pacific Skies now has an elective “Unusual Attitude Recovery” program that can allow you to experience abnormal flight situations and the proper recovery in any attitude. At $200 per hour you are paying for a unique opportunity to train outside the box.